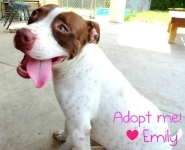 Emily has been adopted hooray! Her name is now Gnocchi she is doing fabulous! Peter Parker is an all-white jack russell terrier mix who has been successfully adopted though AHH HHA Inc. He loves to play in water and cuddle on the couch. Darla is a senior black Labrador Retriever who has been successfully adopted through AHH HHA Inc.
Maximus and Abby are two gorgeous Chihuahuas who have been successfully adopted through AHH HHA Inc.
Rudy is a large terrier who has a big heart. Through AHH HHA Inc., he found a home where he is also loved back. He enjoys playing ball and tug of war. Autumn is a beautiful Treeing Walker hound who was successfully adopted though AHH HHA Inc.
All dogs up for adoption come spayed and neutered and are free of internal and external parasites. They have their first vaccinations and are dewormed. They will come with flea medication, food, bowls, a bed, a kennel, and a microchip on request. Potential parents must fill out an application. We will request a home consultation with you before you can receive your pet. The adoption fee for dogs is $100.00 USD, payable by cash, paypal, credit card or money order.